A glorious companion volume to Robinson's world-wide bestselling trilogy. All Colours Mars Red Mars. Green Mars. Blue Mars. The Mars trilogy has rapidly assumed the status of modern science fiction classic, capturing the imagination of hundreds of thousands of readers around the world. 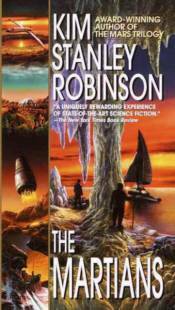 Now, with The Martians, comes Kim Stanley Robinson's essential companion to the Mars series. New novellas and short stories head the collection, along with texts on the Martian constitution, maps and Martian inspired poetry. In short, The Martians is a unique collection of previously unpublished fiction, a fascinating addition to Robinson's oeuvre, and a must for all lovers of the red planet.